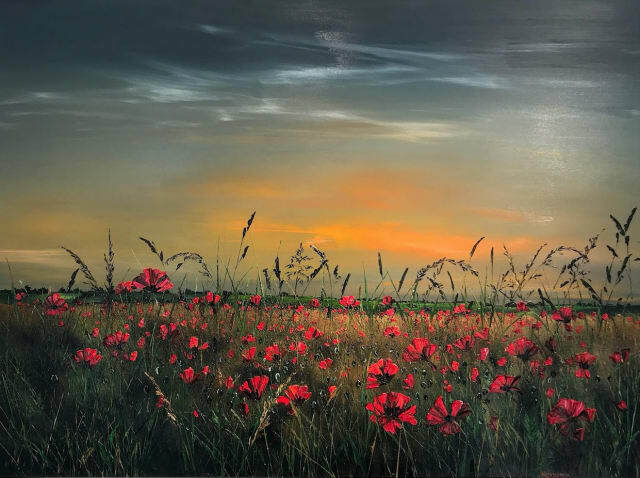 Kimberley Harris is an oil landscape artist focused on capturing the natural beauty of the countryside. From portraying meadows and cornfields bursting with colour, to depicting the eerie beauty of derelict buildings, Harris is intent on encapsulating the soul and atmosphere of these places on canvas. Harris has honed her style from her deep enchantment with light, shadows, and how they affect each other at various times of the day. All of her paintings go through a process of layering, blending, and palette knife work to ensure the texture, tone and light does justice to the places she portrays. Browse our collection of original Kimberley Harris paintings here. Kimberly Harris became enamoured with painting after being taken by her father to a JMW Turner exhibition at the Tate Gallery as a child. Nine years later, in 2005, she gained a Diploma in Art and Design, but only re-ignited her passion for painting in 2014. She tried her hand at jewellery design, but ultimately always felt that painting was her true creative calling. After meeting and being encouraged by fellow Suffolk artist David Porteous-Butler, Harris decided to pick up the brush again. Porteous-Butler had a huge impact on her painting style by introducing her to oils and the palette knife, with the latter becoming invaluable to her aesthetic. Harris is inspired by both the impressionist and romanticism movements, and claims her favourite painting is the The Boulevard Montmartre at Night by Camille Pissarro, commending the atmosphere and presence of the piece. She also cites Led Zeppelin, Seasick Steve and Fleetwood Mac as creative muses. Harris launched her first solo exhibition in the UK in 2016 at the Cloud Gallery in West Sussex, and has since featured in galleries throughout the UK.